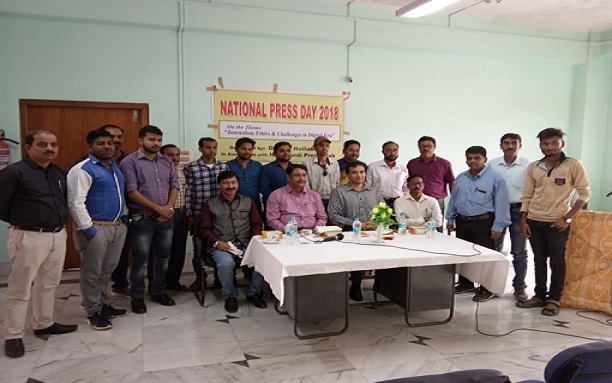 National Press Day 2018 was observed in a befitting manner in Hailakandi district on Friday. Speaking as chief guest at a function organised by the District Information and Public Relations in association with the Hailakandi Press Club at its office premises, Deputy Commissioner Adil Khan said media must focus on balanced news based on truth and knowledge in a fast-paced era of digital news. Khan said the challenges in the digital age can be overcome when there is fair and balanced reporting based on impartiality and truth. “Journalistic ethics and challenges in the age of digital era can be overcome when both sides of the story are projected to put things in proper perspectives before the viewers and audiences,” he added. The Deputy Commissioner said the media being the fourth pillar of democracy has a pivotal role to play and it can be a prime mover of things in society. “The social evils plaguing the society can be solved through the powerful and influential media,” he said while exhorting upon the need to maintain credibility despite odds. Khan said the holding of this event offers opportunity to the media persons to go in for self-analysis or self-introspection as to what they can do for the greater cause of the society. On journalism ethics, Khan said it should be self-imposed and inculcated as an internal quality guided by fairness, impartiality and truth. The Deputy Commissioner asked the media to be watchdogs in pinpointing the foibles of the administration but at the same time to appreciate the good work done. “We are prepared to receive brickbats for doing something wrong either through omission or commission but we expect appreciation for good initiatives that will help us to inspire and motivate to do much greater work for the betterment of society,” he said, adding that media has to be partners with the government in development. Speaking on the occasion, District Information and Public Relations Officer, Sabir Nishat said digital media has a significant and complex impact on society and combined with internet and personal computing has caused disruptive innovations in publishing, journalism, public relations, entertainment, education, commerce and politics. Journalist Nilotpol Deb said media persons must be particularly careful to verify facts in the midst of confusion about the authenticity of information published on social media ‘to avoid dilution of actual facts’. Columnist Satananda Bhattacharjee underscored the need to maintain highest ethical standards and a commitment to the uncorrupted pursuit of truth based on verifiable facts and knowledge. He said the ethical dilemmas confronting the media persons in the digital era can be overcome if it is viewed as an opportunity rather than a challenge. Echoing the views of the Deputy Commissioner, President of Hailakandi Press Club, Noimul Islam Choudhury, who presided over the function, said media persons must introspect for themselves as to the cascading effects a news report can augur for the society. Senior journalist Amit Ranjan Das and general secretary, Hailakandi Press Club, Rahul Chakraborty also spoke on the occasion.